I did several embroidery projects during the weeks when the featured color was pink and green. 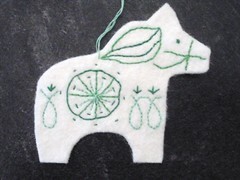 Green hand-embroidered Dala horse and tree. They can be used as ornaments or tags. 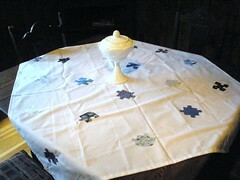 For the Blue Week, I did some sewing projects – a bunting and tablecloth. the white fabric using an iron-on adhesive. For many of the weeks, I enjoyed making window stars in a variety of colors. 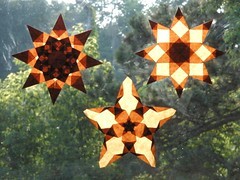 It was fun to create new patterns and see what the new window star would turn out like. Trio of purple window stars. The pattern on the bottom is one I created. 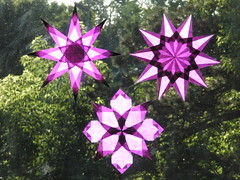 Equally exciting for me was to see what window stars look like in different colors using patterns that I normally use. Trio of brown window stars. I’ve made these patterns before, but never in orange. the pattern on the right is a new one I created. but never in yellow until The Summer of Color challenge. My on-going project during the summer was a quilt. Each week, after the color was assigned, I created two quilt blocks that were about 11 1/2″ square. Each square included seven different patterns of fabric – to represent the seven days of the week. My goal was to use only fabric, thread, and batting that I had on hand. This wasn’t a challenge when I was doing the squares – it seemed like I had plenty of fabric to choose from. Five weeks’ worth of quilt squares. However, once I got to the backing and batting, it became a bit more difficult. I didn’t have either the fabric or batting in the size I needed for the quilt. So, I had to piece both elements together to create the quilt. The batting needed to be hand-sewn in order to attach each piece to one another (there were three pieces of batting used). 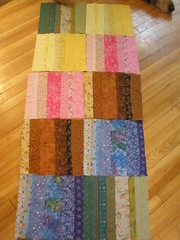 For the quilt back, I used one of Sophia’s floral-print sheets and cut about a six-inch section off the end. By cutting that in length-wise and sewing the pieces together, I was able to create enough fabric to sew to the other piece…thereby creating a quilt backing. Quilt squares bordered by 3″ white fabric strips. bed linens that were discarded from a hotel. to use the fabric to make the quilt. What I like about the quilt is that it is made entirely from fabric, thread, and batting that I had on hand. I didn’t have to purchase anything to make it! the temperature is well below zero. we homeschool and read together. Your quilt is beautiful! As well as all of your other work. Sounds like a wonderful summer of crafting! So lovely – your window stars are my favourites. Great to see everything together. 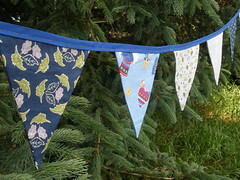 I'd love some bunting in my kitchen. You do some amazing work! Love your colors of summer pieces. 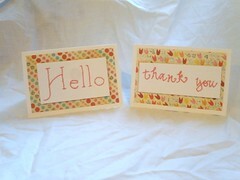 Thanks for coming by my blog and leaving a comment…I appreciate it and your Quilts are out of this world!! Happy rest of the summer to you and yours. oh my goodness, that quilt is extraordinary. I wish I could do this! I just love the paper quilting too! I am going to add my voice to the rest….awesome quilt! I love the concept and the finished product so much that I am putting this on my Summer 2011 to do list.Wonderful job!